Find a Private / Custom trip that explores Lithuania. There are 4 tours to choose from, that range in length from days up to days. The most popular month for these tours is , which has the most tour departures. 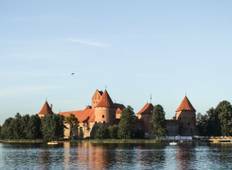 "Great way to explore Lithuania with an experienced, knowledgeable guide. Comfortable..."
"A professionally organised and action-packed itinerary. Alina welcomes you with her..."